So here is the thing with training. 90% of people over train. People think that when you are training your getting faster or stronger. NO your not. Your training is a load stimulus on your system for your body to create that adaptation. Its a real simple fomula and that fomula is W+R=S and that is work plus rest equals sucess. Its getting enough rest so you can train again. The trick is knowning when you can train again. This is where ithlete is so important. With ithlete I can get fast and precise results of heart rate variability in a simple format that almost anyone can understand. Big deal you say? I already get heart rate information right form my sport watch or GPS/HR unit, heck I can take my pulse with only a watch. You may also believe that a healthy and fit individuals heart beats with a metronome like regularity, and a lower resting HR is always better and a sign of higher fitness and greater recovery. Hold on there Scooter. Repeat after me "Heart rate variability", HRV for short is not just a simple heart rate measurement. HRV differs from your basic heart rate measurement in that HRV is measuring the beat-to-beat interval known as the R-R interval differences in milliseconds. The more variable this R-R interval is the better regardless of the heart rate. A stressed, tired, overtrained person will have a low HRV and a well trained and recovered person will have a high HRV. Why is HRV important for my health and even my performance? Your heart rate and HRV of that HR are controlled by the Autonomic Nervous System ANS and is classically divided into two subsystems: the parasympathetic nervous system (PSNS) and sympathetic nervous system (SNS). For an analogy, one may think of the sympathetic division as the accelerator and the parasympathetic division as the brake. The sympathetic division typically functions in actions requiring quick responses. The parasympathetic division functions with actions that do not require immediate reaction. Consider sympathetic as "fight or flight" and parasympathetic as "rest and digest" or "feed and breed". However, many instances of sympathetic and parasympathetic activity cannot be ascribed to "fight" or "rest" situations. For example, standing up from a reclining or sitting position would entail an unsustainable drop in blood pressure if not for a compensatory increase in the arterial sympathetic tonus. Another example is the constant, second to second modulation of heart rate by sympathetic and parasympathetic influences, as a function of the respiratory cycles. More generally, these two systems should be seen as permanently modulating vital functions, in usually antagonistic fashion, to achieve homeostasis. HRV gives us a non invasive way to gain some insight to how the PSNS and SNS are functioning as a result of recent training and recovery. I first learned about HRV 10 years ago and have been utilizing HRV personally and with a few of my athletes off and on. The problem has been a combination of time and money. There have been a few consumer devices capable of measuring the R-R interval needed to calculate HRV to the consumer market, cost for the devices ranged from $180 - $1000+. The devices worked well but the software that came with them is just plain lacking in usability to analyze HRV especially by the athlete. There are some very good to exceptional software solutions from Biocom $795 - $2700, Firstbeat $2500 + and Omegawave being the gold standard but costs $35,000 is out of reach for most athletes and personal coaches. With most of the software solutions the testing periods are 5 minutes to several hours, the device needed to be downloaded to a computer then analyzed not a problem for me as I have clinical experience in cardiac rehabilitation but the time needed to crunch the numbers was another matter when doing it for my athletes and myself and needed to have the results before they trained that day. For most athletes and coaches this is just unfeasible to be done on a daily basis as the whole process took way to long. I never gave up my search for a more affordable solution that would provide reliable results, that the athlete on their own could understand and took very little time so they could implement into their daily routine. With the advent of smart phones that now have the computing power what a large desktop units had only a few years ago was the first part of the solution. 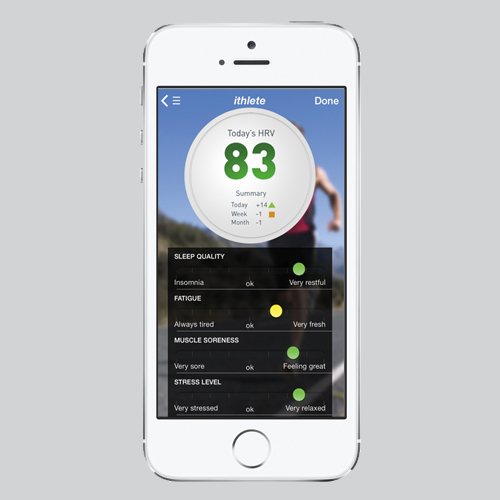 The final part of the HRV solution has been cracked by Simon Wegerif inventor of ithlete. The ithlete system comprised of four parts #1 Smart Phone or Tablet, I do not know a single adult that does not have at least one of these devices so that is one. #2 the ithlete receiver that plugs into the smart device, #3 heart rate transmitter strap the ithlete site has a list of the types that work, or both available for $74.99 and #4 the $9.99 ithlete ap, complet under $85 a real bargain if you ask me. Using ithlete is simple. Install the ap on your device, put on the heart rate strap, start the ap and follow the on screen instructions, breath in and out along with the animated lungs and in 60 seconds you have an HRV score. Results are displayed with an HRV score, daily change, weekly change, and month change along with a line graph. For those of you that take your waking resting heart rate this will not be much of a change in your routine, though I do give myself a bit of time to adjust in the am and have a glass of water along with other natural process that are needed as I wake then I take my HRV test as I am making coffee. You will need 7-10 days of daily testing and is recommended that this first week take place during an unloading period AKA recovery week this will set your base line. From there the user will get weekly and monthy change indications, esentally when you train harder your HRV will decrease and as you recover HRV should increase. The biggest mistake most people make is overtraining. The real trick is knowing when you can go hard and knowing when to go easy or take the day off. And to quote G.I. Joe "Knowing is half the battle" and knowledge is power. With ithlete what you get is a very easy to use interface with results that are simple to understand to help anyone know if they should train hard that day, take a day off or do regenerative activities all from a simple 1minute test period. Also when you track this you will get a better understanding on how much recovery you will need for specific workouts. The ithlete manual is very thorough and provides good amount of the basic information about HRV and how you can use ithlete to improve your performance. 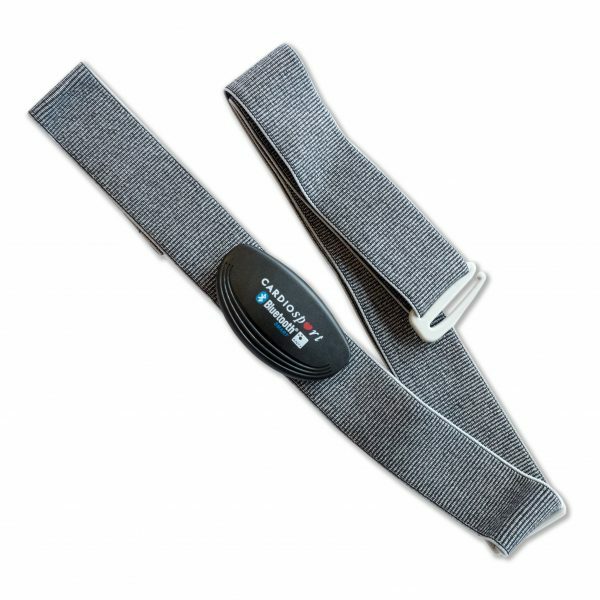 The company offers several ways to measure your HRV but we really like the bluetooth stap. The bluetooth strap is easy to put on and you dont have to add anyting onto your phone. The strap is the way to go.